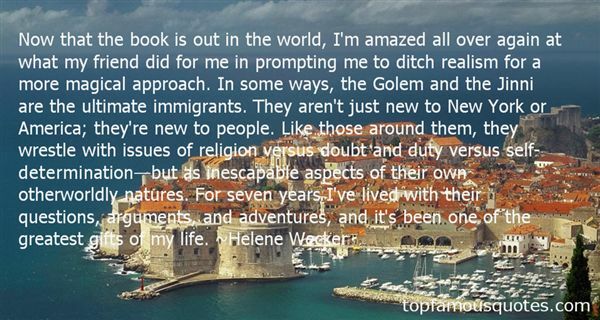 Reading and share top 22 famous quotes and sayings about Golem by famous authors and people. Browse top 22 famous quotes and sayings about Golem by most favorite authors. 1. "A vjerovali su još i u nešto što se zvalo Raj;no unatoc toga pili su goleme kolicine alkohola." 2. "When you are born," the golem said softly, "your courage is new and clean. You are brave enough for anything: crawling off of staircases, saying your first words without fearing that someone will think you are foolish, putting strange things in your mouth. But as you get older, your courage attracts gunk, and crusty things, and dirt, and fear, and knowing how bad things can get and what pain feels like. By the time you're half-grown, your courage barely moves at all, it's so grunged up with living. So every once in awhile, you have to scrub it up and get the works going, or else you'll never be brave again." 3. "Casový golem povstal a byl, ignoroval linearitu kolem sebe, pouze byl.Byl narušením, strašlivým proniknutím do sledu okamžiku, sraženinou v diachronii, která s nemyslící arogancí své existence nevenovala tomuto zprznení ontologie sebemenší pozornost.The time golem stood and was, ignored the linearity around it, only was. It was a violence, a terrible intrusion in the succession of moments, a clot in diachrony, and with the dumb arrogance of its existence it paid the outrage ofontology no mind." 4. "Daniel Goleman has proven that two-thirds of the success in business is based upon our Emotional Intelligence as opposed to our IQ or our level of experience. As we look for the next crop of future CEOs, maybe it's time for America's corporations to start interviewing grads from the psychology master's programs rather than the M.B.A. programs." 5. "I look over at him. He stares straight ahead. "So," I say. "Golem, huh? ""I prefer the term 'Mineral-American." 6. "According to Thomas, the city [of Bath] had once been a veritable hotbed of manifestations, with every sorcerer, bunyip, golem, goblin, pict, pixie, demon, thylacine, gorgon, moron, cult, scum, mummy, rummy, groke, sphinx, minx, muse, flagellant, diva, reaver, weaver, reaper, scabbarder, scabmettler, dwarf, midget, little person, leprechaun, marshwiggle, totem, soothsayer, truthsayer, hatter, hattifattener, imp, panwere, mothman, shaman, flukeman, warlock, morlock, poltergeist, zeitgeist, elemental, banshee, manshee, lycanthrope, lichenthrope, sprite, wight, aufwader, harpy, silkie, kelpie, klepto, specter, mutant, cyborg, balrog, troll, ogre, cat in shoes, dog in a hat, psychic and psychotic seemingly having decided that this was the hot spot to visit." 7. "Osjetila se pomalo izdanom i tužnom, ali u taj mah na vidiku se pojavio golemi pokretni predmet. Bilo je to veliko stablo kestena u punom cvatu koje su vozili na Champs-Elysees, privezano na velikom kamionu, koje se naprosto treslo od smijeha - kao kakva ljupka osoba koja se našla u nedostojanstvenom položaju, ali svejedno zna kako nije ništa izgubila od svoje ljupkosti. Promatrajuci stablo s uživanjem, Rosemary se poistovjetila s njime, i veselo se s njime smijala, i sve se odjednom opet cinilo prekrasnim." 8. "The tide of her exhilaration drained from her, leaving her exhausted and heartsick. She would have bound the entire city, made them all into her golems, to satisfy her own need to be useful." 9. "Now that the book is out in the world, I'm amazed all over again at what my friend did for me in prompting me to ditch realism for a more magical approach. In some ways, the Golem and the Jinni are the ultimate immigrants. They aren't just new to New York or America; they're new to people. Like those around them, they wrestle with issues of religion versus doubt and duty versus self-determination—but as inescapable aspects of their own otherworldly natures. For seven years I've lived with their questions, arguments, and adventures, and it's been one of the greatest gifts of my life." 10. "Za sto sluzat knigite ako ne ne vrajkaat kon zivotot, ako ne uspevaat vo toa da ne nateraat da ja izgasneme zedta so pogolema alcnost." 11. "I need to add that my work on multiple intelligences received a huge boost in 1995 when Daniel Goleman published his book on emotional intelligence. I am often confused with Dan. Initially, though Dan and I are longtime friends, this confusion irritated me." 12. "The Rabbi thought he saw an expression of perplexity in the golem's eyes. It seemed to the Rabbi that his eyes were asking, 'Who am I? Why am I here? What is the secret of my being? Rabbi Leib often saw the same bewilderment in the eyes of newborn children and even in the eyes of animals." 13. "The streets of Prague were a fantasia scarcely touched by the twenty-first century—or the twentieth or nineteenth, for that matter. It was a city of alchemists and dreamers, its medieval cobbles once trod by golems, mystics, invading armies. Tall houses glowed goldenrod and carmine and eggshell blue, embellished with Rococo plasterwork and capped in roofs of uniform red. Baroque cupolas were the soft green of antique copper, and Gothic steeples stood ready to impale fallen angels. The wind carried the memory of magic, revolution, violins, and the cobbled lanes meandered like creeks. Thugs wore Motzart wigs and pushed chamber music on street corners, and marionettes hung in windows, making the whole city seem like a theater with unseen puppeteers crouched behind velvet." 14. "He remembered a story Madrigal had told him once: the human tale of the golem. It was a thing shaped of clay in the form of a man, brought to life by carving the symbol aleph into its brow. Aleph was the first symbol of an ancestral human alphabet, and the first letter of the Hebrew word truth; it was the beginning. Watching Karou rise to her feet, radiant in a fall of lapis hai, in a woven dress the colour of tangerines, with a loop of silver beads at her throat and a look of joy and relief and... love... on her beautiful face, Akiva knew that she was his aleph, his truth and beginning. His soul." 15. "Pogledaj sve ovo",pokazuje rukom prema nebu. "Vidiš li koliko je golemo?A ipak je uredeno,planirano?Bog je svoja pravila i zakone primijenio na sve,pa zašto bi ti bio iznimka?" 16. 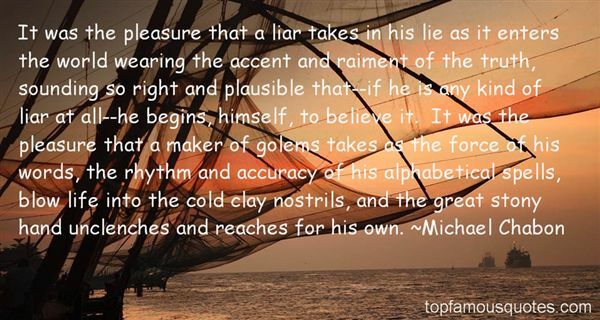 "It was the pleasure that a liar takes in his lie as it enters the world wearing the accent and raiment of the truth, sounding so right and plausible that--if he is any kind of liar at all--he begins, himself, to believe it. It was the pleasure that a maker of golems takes as the force of his words, the rhythm and accuracy of his alphabetical spells, blow life into the cold clay nostrils, and the great stony hand unclenches and reaches for his own." 17. "Every universe, our own included, begins in conversation. Every golem in the history of the world, from Rabbi Hanina's delectable goat to the river-clay Frankenstein of Rabbi Judah Loew ben Bezalel, was summoned into existence through language, through murmuring, recital, and kabbalistic chitchat -- was, literally, talked into life." 18. "Then, in spite of everything, he began to smile. So much of his existence in Everlost had been full of despair. Despair, and a fear of losing what he had. But Allie was not lost, she was just there across the river, waiting for him to find her. Nick was not lost either--not entirely.It was then that Mikey McGill realized something. It must have been his sister who first called this place Everlost, because by naming it so, it stripped away all hope except for a faith in her, and the "safety" she could provide. Well, Mary was wrong on all counts, because nothing in Everlost was lost forever, if one had the courage to search for it.Mikey held tightly on to this shining truth as he and the golem sunk into the earth. Then with all the force of his heart, his mind, and his soul, Mikey McGill began to dig." 19. "Sad mi je jasno da sam se vec dugo kretao prema Tebi i Ti prema meni. Premda ni jedno od nas nije bilo svesno postojanja drugoga pre nego smo se upoznali. Za sve vreme u našoj je nesvesnosti radosno lutala neka slepa izvesnost koja je garantovala da cemo se sresti. Poput dveju usamljenih ptica što svoj put preko golemih prerija pronalaze pomocu nebeskih znakova, tako smo se i mi sav svoj život kretali jedno prema drugom"
20. "Sve dok nisam došao do carobne rijeci.Amber.(... )Rijec bijaše nabijena strahovitom cežnjom i golemom nostalgijom. Imala je, zamotan u sebi, osjecaj zaboravljene ljepote, grandioznih dostignuca i moci užasne i gotovo konacne. Nekako, ta je rijec pripadala mom rjecniku. I nekako, ja bijah dio nje, a ona dio mene. Bijaše to ime mjesta, znao sam, mjesta koje sam nekoc poznavao. Ali nije izazivala nikakve slike, samo osjecaje." 21. "Menkiausia smulkmena, kritusi i smegenu dirvožemi, gali išaugti i siaubinga monstra. Golemas iš nežinios molio. Nulipdytas iš netikrumo ir baimes. Milžinas, atsisukantis prieš savo kureja." 22. "Not to know one's true identity is to be a mad, disensouled thing — a golem. And, indeed, this image, sick-eningly Orwellian, applies to the mass of human beings now living in the high-tech industrial democracies. Their authenticity lies in their ability to obey and follow mass style changes that are conveyed through the media. Immersed in junk food, trash media, and cryp-tofascist politics, they are condemned to toxic lives of low awareness. Sedated by the prescripted daily television fix, they are a living dead, lost to all but the act of consuming." According to James Mann's Rise of the Vulcans, once a year in the 1980s, the Reagan administration flew Cheney to a secret bunker to practice rebuilding the government if the Soviets destroyed Washington. Cheney's role, Mann reported, was to use his White House chief of staff experience to run the government in the name of any surviving cabinet member who made it to the bunker. The Reagan plan ignored the Presidential Succession Act, a 1947 law that put two top congressional leaders higher in the line of succession than cabinet secretaries. The program also made no plan for reconstituting Congress, because "it would be easier to operate without them," a participant told Mann."